Fingerless Gloves — Why crochet them? Fingerless gloves could be the perfect DIY crochet gift. They are functional, fashionable, and budget friendly. Fingerless gloves are functional because they keep your hands and wrists warm, while still be able to use your fingers for texting. Another way to say it, is they offer the comfort, coziness and warmth of gloves without the inconvenience of them. They are fashionable because they make it easy to incorporate this season’s hot colors into your wardrobe. They are budget friendly due to amount of materials used to create them. 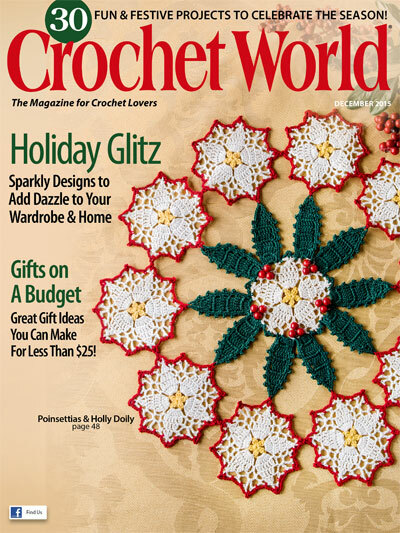 The pattern for the Burning Embers Mitts can be found in the December 2015 issue of Crochet World.